There’s a new marathon world record—and it’s quite a bit faster than the old one. 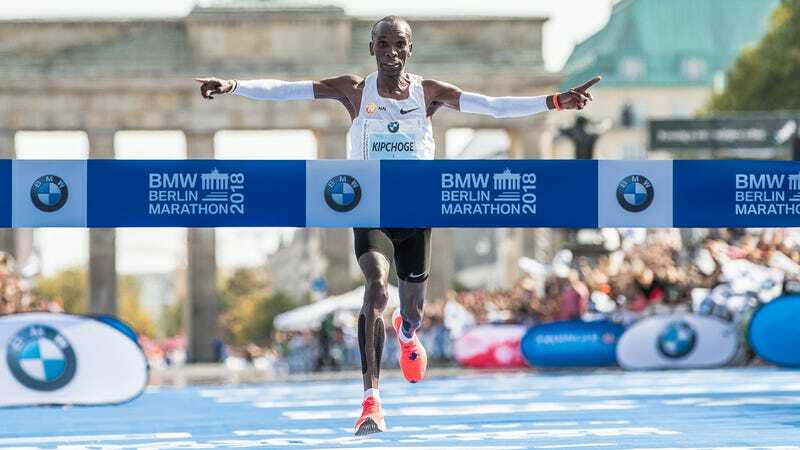 Eliud Kipchoge won the Berlin Marathon this morning in a time of 2:01:39. That’s 78 seconds faster than Dennis Kimetto’s previous record mark of 2:02:57. Amazingly, Kipchoge lost his pacesetters about 15 miles into the 26.2-mile race. He actually ran negative splits: He went through the halfway point at 1:01:06, and ran a 1:00:34 for the second half. Last year, Kipchoge ran a 2:00:25 marathon as part of Nike’s Breaking2 PR stunt, but that artificial setting—alongside 30 pacers on a Formula 1 racetrack—meant it did not count for record purposes.